Welcome to the final day of my Good-bye Summer...Hello Fall Giveaway week! On Day 1 of this theme week, I asked you what scents came to mind when you thought of the Fall season. You have all been giving such great answers, and many of you responded that Pumpkin and Rain were some of your favorite Fall aromas, which I would definitely agree with. One winner will be able to treat their skin to an all natural softening experience, and they will also be able to enjoy the scent of Pumpkin and Rain at the same time! THE PRIZE: The package for this giveaway includes two 8 oz. lotions and two 4 oz. 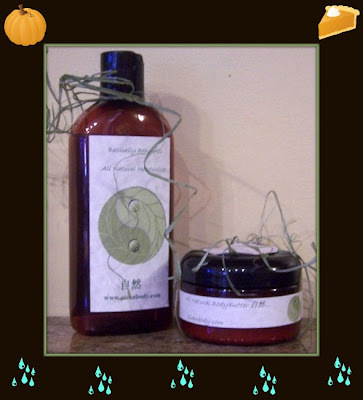 body butters--a lotion and butter in Rain, a lotion and butter in Pumpkin. (photo is for reference and only shows one of each product). We make them fresh, based on YOUR order. They are not sitting on warehouse shelves LOADED with chemical preservatives to sustain shelf life. Our body products contain NO sulfates, NO parabens, or any other chemicals that are scientifically proven to be linked to cancer. You can actually read our product labels, and pronounce every word. Our ingredients are simple, because they should be. The combinations of enriching oils, vitamin E, butters, aloe, and essential oils give our products the advantage over the chemically overloaded products that line the store shelves. Time and time again nature has prevailed in enriching us with some of its finest ingredients for our skins beauty. Because Zi Ran's products are all natural, there are no synthetic preservatives. They use natural preservatives and because of that, their shelf life is about six months. I personally have never had one of their products that long, because I use them up before then! After sampling their scents last year, I've since ordered every scent they currently offer, and my favorites are the Pumpkin and the Rain. If I was asked to describe the scent of their Rain lotion, it smells clean and fresh with a light floral scent and just enough musk to give it that hint of actual Rain mixed with earth smell. It's not an exact "rain in the Fall" dupe, but it is a very nice fragrance. The Pumpkin scent is, hands down, the absolute best pumpkin scented body product I've ever found. I've been tempted to actually taste it (hey, it's all natural, right?!! ), it smells that good. RAIN: Fresh aquatics with very, very light florals and subtle fruits, yield to a harmonious blend of musks and sandalwoods to create one of the best aquatic scents out there today. PUMPKIN: Hints of pumpkin,cinnamon, clove and nutmeg round out this wonderful hearty, fall scent. Warm, natural and robust! THE RULES: This is only open to those who answered Pumpkin and Rain in Monday's post...I'M KIDDING! If any of my lovely followers would like to enter for a chance to win these goodies, just leave your eMail in the comments section below. A reminder that all prizes offered this week are open for entry through September 10, and that all winners will be announced on Monday, September 12. Products will be shipped directly from Zi Ran Body, so this is only open to U.S. residents. Followers only, please. Rain sounds awesome! Thanks, Mary! Mmmmmm....I can taste er smell them already! LOL. Rain sounds really nice and I love pumpkin scents around this time of year. These sound like some wonderful products. Thanks for all of the giveaways this week Mary. Your beyond kind! Have a wonderful weekend. These look like good products to try. That pumpkin scent sounds great! Oh I love a good rain-scented beauty product! Those look and sound so delicious! Rain sounds really interesting - I'd love to try it! It's not midnight in California yet!